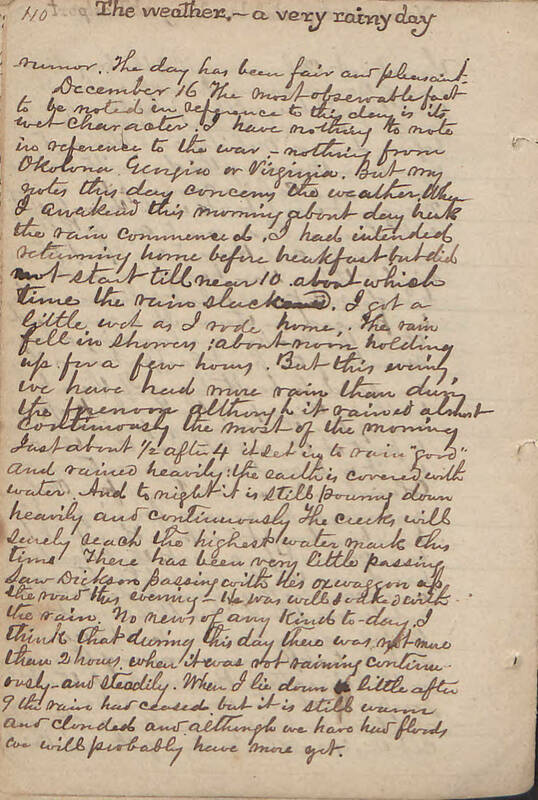 Item Description: Diary entry, dated 16 December 1863, from the Samuel A. Agnew Diary. He discusses extraordinary rainfall and a lack of news of the war. Item Citation: From folder 9 of the Samuel A. Agnew Diary #923, Southern Historical Collection, Wilson Library, University of North Carolina at Chapel Hill. The weather: a very rainy day. The most observable fact to be noticed in reference to this day is its wet character. I have nothing to note in reference to the war, nothing from Okolona, Georgia or Virginia. But my notes this day concern the weather. When I awakened this morning about daybreak the rain commenced. I had intended returning home before breakfast, but did not start till near 10, about which time the rain slackened. I got a little wet as I rode home. The rain fell in showers. about noon, holding up for a few hours. But this evening we have had more rain than during the forenoon although it rained almost continuously the most of the morning. Just about 1/2 after 4 it set in to rain “good” and rained heavily: the earth is covered with water. And tonight it is still pouring down heavily and continuously. The creeks will surely reach the highest water mark this time. There has been very little passing. Saw Dickson passing with his ox waggon up the road this evening. He was well soaked with the rain. No news of any kind today. I think that during this day there was not more than 2 hours when it was not raining continuously and steadily. When I lie down a little after 9 the rain had ceased, but it is still warm and clouded and although we have had floods we will probably have more yet. This entry was posted in Southern Historical Collection and tagged rain, Samuel A. Agnew, weather. Bookmark the permalink.